Game of Thrones Season Seven Card Case. Contents: Factory sealed case, 12 card boxes and 1 case topper. Boxes have 24 packs, 5 cards per pack, 2 autograph cards, random sketch and chase cards. The item "Game of Thrones Season 7 Sealed Factory Sealed Case / 12 Card Boxes" is in sale since Friday, June 1, 2018. 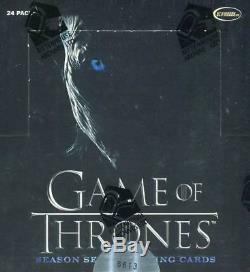 This item is in the category "Collectibles\Non-Sport Trading Cards\Game of Thrones Trading Cards\Sealed Trading Cards". The seller is "barringtoncards" and is located in Island Lake, Illinois. This item can be shipped to United States, all countries in Europe, Canada, Japan, Australia.